Drug discovery scientists are continuously in search of new technologies and methodologies that will deliver more information, faster screening and greater insight. Sergei Dikler discusses the role that mass spectrometry and the latest MALDI-TOF systems have in the future of drug discovery. Developments in screening and detection techniques alongside advances in automation and computer technologies have paved the way for the emergence of High-Throughput Screening (HTS), which allows pharmaceutical researchers to quickly and cost-effectively assess large numbers of compounds for suitability to be advanced through the drug discovery and development process. While factors such as target selection and assay design remain within the researcher’s control, the primary consideration for successful high-throughput screening remains the selection of the appropriate technology and method. • How many of your target types can be assessed? • Do the readouts provide more relevant information than your current assays? • Does it deliver appropriate sensitivity? • Can you work at relevant concentrations? • Does the complexity of detection steps required limit ease of assay development? • Does it deliver appropriate sample throughput speed? • Can you identify and control artifacts or potential interferences? • Is the implementation cost prohibitive? • What level of training/ skill is required to use the instrument effectively? • Can it be adopted, and deployed, throughout the organisation? Over the past decade, label-free detection methods based on mass spectrometry (MS) have expanded into HTS applications to replace traditional biochemical assays, which required chemical derivatisation of substrates using labelling reagents necessary for detection. 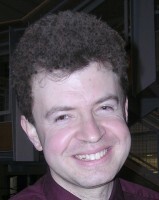 Early MS techniques – including multiplexed liquid chromatography (LC)-MS technology – provided more information on samples than the single point, single analyte traditional biochemical assays. But this additional data came at a cost. With cycle times of up to 30 seconds per sample using (LC)-MS technology, and around 10 seconds per sample when using Solid Phase Extraction (SPE) techniques, mass spectrometry was still considered relatively slow for routine HTS. Most recently, MALDI-TOF (matrix-assisted laser desorption/ionization time-of-flight mass spectrometry) has been re-examined and has emerged as a compelling alternative for high-throughput MS detection in the pharmaceutical industry. The latest MALDI-TOF systems offer a number of benefits in comparison to the LC-MS and SPE-MS alternatives (Table below). So, how do these benefits translate into real-world performance in the lab? As an example, let’s take a screening of 200,000 compounds, comparing MALDI-TOF with a x4 LS-MS multiplex assay and SPE-MS alternatives. With an assumed cycle time of 20 seconds per sample from a x4 multiplex assay, it would take 54 days to complete the screen. The SPE-MS method, with a cycle time of 7.5 seconds per sample, would complete the screen in 20 days. A MALDI-TOF protocol, with a 1 second cycle time per sample, would screen the 200,000 compounds in just 3 days. The latest MADLI-TOF systems meet the necessary criteria for a new HTS methodology across pharmaceutical applications. From a practical perspective, the technology delivers on multiple counts – enabling straightforward method development and providing monitoring of relevant products at appropriate levels of sensitivity. Notably, assays are also lower in cost when compared with alternative LC-MS and SPE-MS methods. Table 1: Throughput calculation: analysis time per sample/samples per day, based on average of three measurements per target using different acquisition parameters. Most importantly of all, with the new levels of speed achieved in today’s instruments, MALDI-TOF now enables screening of the very largest libraries of compounds, permitting true acceleration of the early stages of the drug discovery and development process. Recent work has established a new performance benchmark for an optimised, fully automated high-throughput screening system based on MALDI-TOF instrument. A fully automated MALDI PharmaPulse system (Bruker Daltonics) was used to process the plates containing the quenched assay reaction mixture, alpha-cyano-4-hydroxycinnamic acid matrix solution and wash solvent. The system included an ACell robotic arm (HighRes Biosolutions), PicoServe plate hotel (HighRes Biosolutions), LidValet delidder (HighRes Biosolutions), and mosquito HTS liquid handler (TTP Labtech). The system transferred, in 1536 well format, a sample of reaction mixture and matrix onto MALDI targets comprised of an adapter and polished steel insert with 1.0 mm thickness. After drying, the samples were analyzed on an autoflex speed MALDI-TOF mass spectrometer (Bruker Daltonics Inc.) equipped with a 2 kHz solid state laser and Acquiris 4 GHz digitizer. The automated runs were set up with 100-1000 laser shots per spectrum to assess the overall speed of analysis. The run time per target was averaged from three measurements and used to calculate the analysis time per sample and the throughput per day. The analysis time of MALDI high-throughput screening runs was consistently less than 1 second per sample, with best performance at a significantly reduced to 0.54 seconds per sample (Table 2). This equates to an ability to analyse more than 121,000 samples per day. 2 minutes 9 seconds on average. Expanding the detection range from 500 Da wide window (2700-3200 Da) to 5000 Da wide window (700-5700 Da) increased the run time per target for the 200 laser shot automated run by only 47 seconds, from 14 minutes 59 seconds to 15 minutes 46 seconds (Table 1). Although the detection range has some impact on throughput, the effect on speed is much less significant than the number of laser shots. 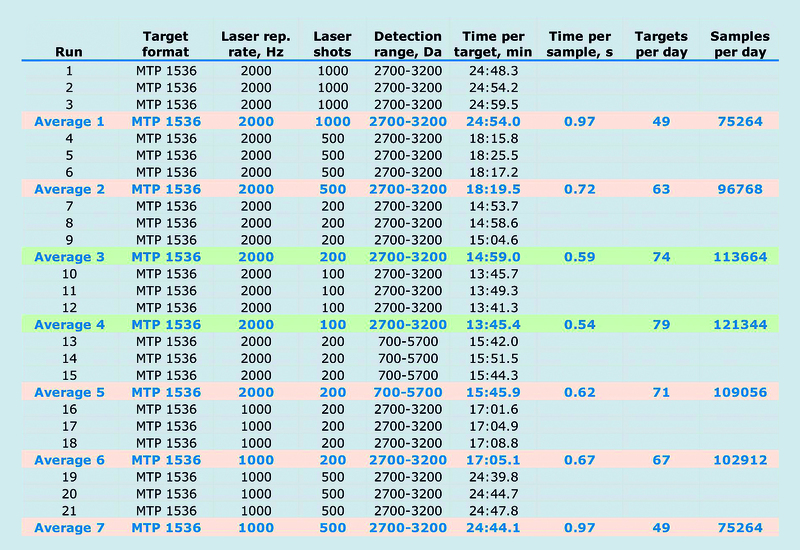 As expected, the laser repetition rate had a significant effect on the analysis time per sample with identical time per sample (0.97 seconds ) for the automated run acquired at 2 kHz and 1000 laser shots and the run acquired at 1 kHz and 500 laser shots (Table 1). times faster than multiplexed LC-MS or SPE-MS techniques. MALDI-HTS is a label-free screening approach that accelerates assay development and provides opportunities for time course measurements from a single well.